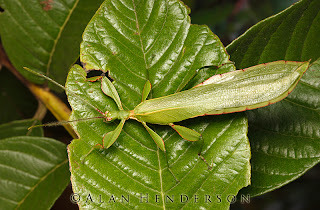 For those interested in Australian phasmids there are several species on the must see list. Up there would be such species as the Lord Howe Island Stick Insect (which was considered extinct until 2002 when it was rediscovered on Balls Pyramid, a small rocky outcrop off the coast of Lord Howe Island. 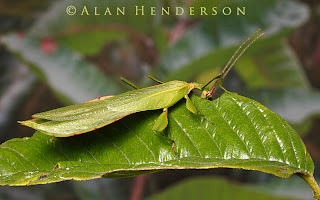 Another on the list would be the true Australian Leaf Insect (Phyllium monteithi). This species is known from only a handful of male specimens, which have been found between Innisfail and Mossman. A female was photographed in the Cairns Botanic Gardens, but the specimen was not collected. Recently we were lucky enough to encounter a live male which turned up on David Rentz's light sheet. Leaf Insects are truly masters of disguise, both sexes are broad and flattened like leaves as juveniles, but only the female remains so as an adult. They are believed to be canopy dwellers which explains the lack of encounters, and may feed on the foliage of Cryptocarya mackinnoniana. They will also feed upon Guava which this specimen certainly did. 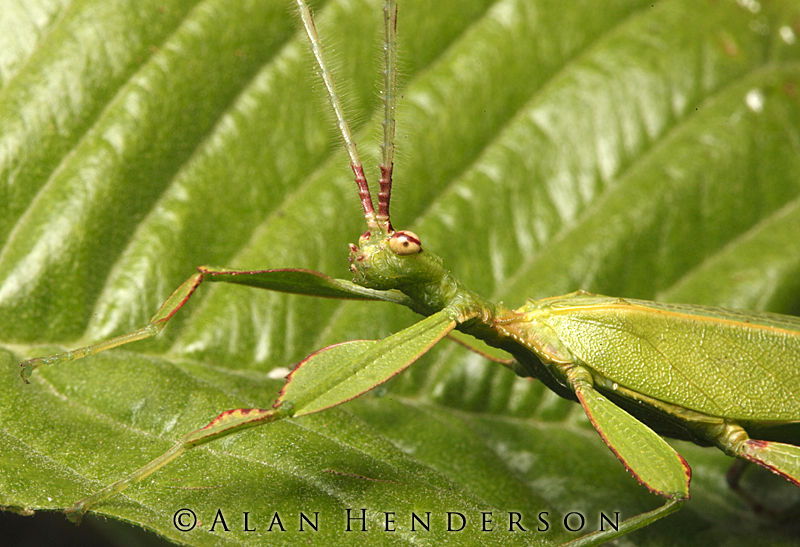 When we first moved to Kuranda we planted several Guava trees just in the hope of attracting these illusive insects. The genus Phyllium is represented by over 30 species throughout southern Asia. The biggest, Phyllium giganteum is a common representative within live insects displays around the world. They are also commonly kept by insect enthusiasts throughout Europe and the USA. The mature male Phyllium monteithi. Males have fully functional wings and are excellent flyers. 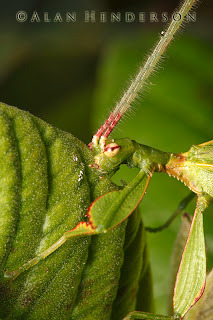 Peeking over a leaf - note the extremely hairy antennae. 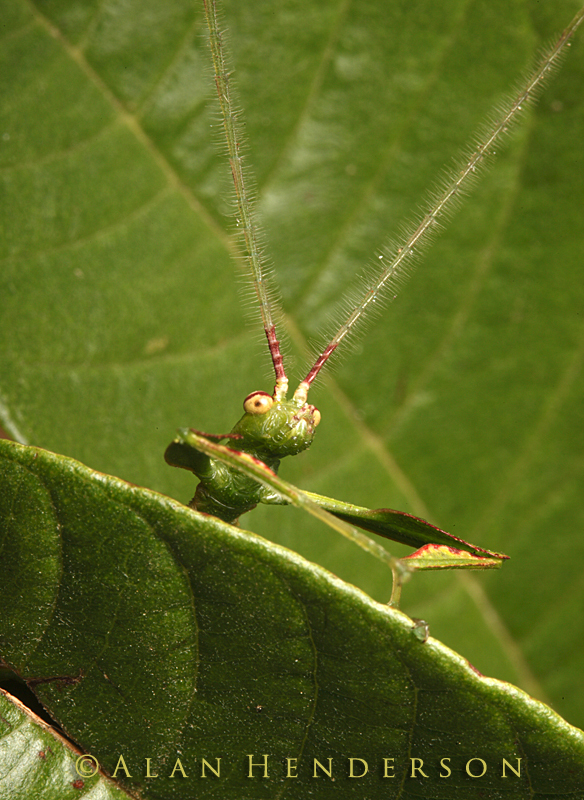 The underside of the abdomen reveals the segments hidden by the wings when viewed from above. 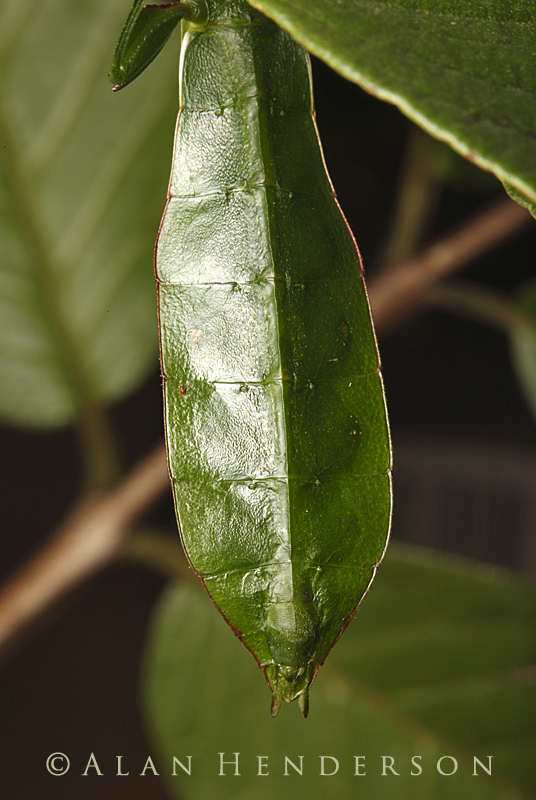 This specimen readily fed upon Guava, one reason we inspect all Guava trees we see with great interest. A close-up of the male feeding. While most male phasmids have some flight capability, this one would readlily take to the air and was quite agile on the wing.